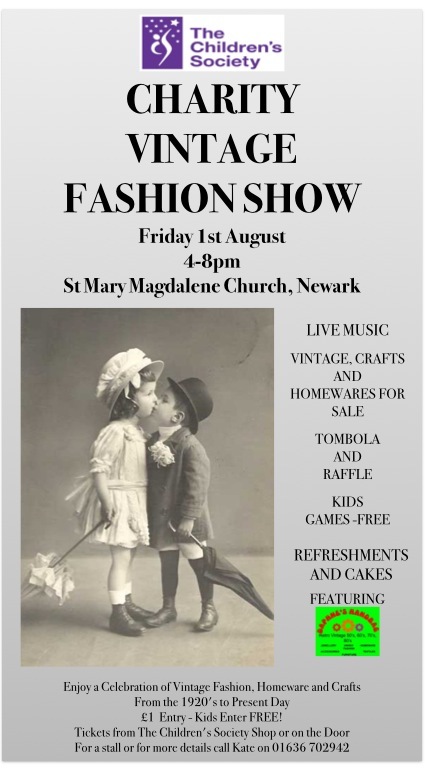 It’s all about vintage on Friday 1 August, when St Mary Magdalene Church in Newark is the stunning setting for The Children’s Society’s Charity Vintage Fashion Show and Craft Fair. Funds raised by the event will be matched by Barclays Bank and all proceeds go to The Children’s Society, helping to support its work to defend, protect and safeguard the childhood of children and young people across the UK through a network of programmes and services. Local models – including the current Miss Newark – will be strutting their stuff along the catwalk in the nave, with John Knight of Vintage2Versace compering the show. And with three separate areas, given over to children’s toys, games and activities, crafts and vintage items, there’ll be plenty to see, do and buy for everyone. The event runs from 4pm till 8pm, admission is £1 with children going free and there’s no need to book, just pay on the door. Even if you can’t make it on the day, you can still buy tickets for the raffle. At £1 each, they’re already on sale at the charity’s shop on Middlegate in Newark and at Daphne’s Handbag on Mansfield Road in Nottingham. With a plethora of prizes on offer, including gift vouchers, beauty treatments, cuddly toys and a very special bottle of Gout de Diamants champagne worth £350 to name just a few, this is one raffle you won’t want to miss! < A mag-nificent offer from your local library!